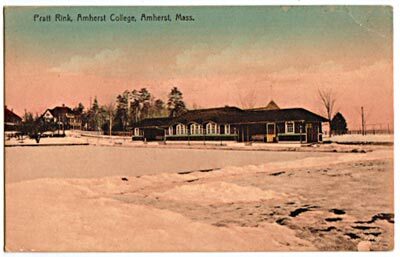 Pratt Rink was located near the gate to Pratt Field, but when Hitchcock Road was created, connecting the Cage and Pratt Field, the rink house was moved nearer the field to become the visitor' field house, and the use of the rink was discontinued. Apparently, the rink was situated such that "the southern sun prevented the surface of the rink from forming a hard surface of ice, and the rink never fully served the purpose for which it was intended" (King, 130). 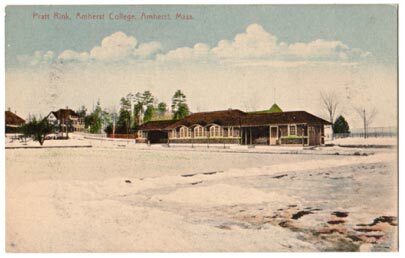 At left, another postcard using the same image, with a bit more of a 'sunset' color-scheme.